“One For The Road” was written for the 1943 film The Sky’s The Limit, where it was introduced by Fred Astaire. Harold Arlen called this song one of his “tapeworms” as at 48 bars, it was longer than the standard 32 bar popular song. 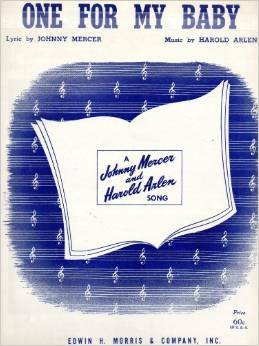 Alec Wilder, in American Popular Song, says that “the honors must go the lyric. … Just imagine having the acuity and courage to start a song, as Mercer does, with “It’s a quarter to three”! “One For My Baby” was recorded on September 13, 1956 and was released as a single in 1957. It was arranged by Ray Conniff. “One For My Baby (And One More For The Road)” was recorded live at Tony Bennett’s concert at Carnegie Hall on June 9, 1962 and was initially released in 1962 on the album Tony Bennett at Carnegie Hall. Ralph Sharon arranged the song. “One For My Baby” was recorded on August 28, 1962 and released in 2013 on the album Bennett/Brubeck: The White House Sessions Live 1962. “One For My Baby (And One More For The Road)” was recorded on April 8, 1964 and released in 2011 on Tony Bennett Live at the Sahara: From This Moment On, as part of the 2011 Complete Collection. It was arranged by Ralph Sharon. “One For My Baby (And One More For The Road) (reprise)” was recorded on April 8, 1964 and released in 2011 on Tony Bennett Live at the Sahara: From This Moment On, as part of the 2011 Complete Collection. It was arranged by Ralph Sharon. “One For My Baby,” part of a medley with “It Had To Be You,” was recorded on June 24, 1970 and features John Bunch on piano. “One For My Baby” was recorded in June 1992 and was released that year on Perfectly Frank. It was arranged by Ralph Sharon. “One For My Baby (And One More For The Road)” with John Mayer was recorded in 2011 and was released that year on Duets II. It was arranged by Marion Evans.